Lissa Thompson joined Ritchie Smith in 1986 to expand the practice based on shared philosophical goals of creating an enhanced quality of life through better design and stewardship of the physical environment. 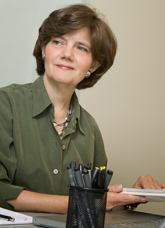 She has managed complex planning projects and designed elegant and artful landscapes for the firm. Her landscape designs are informed by her background in fine art. A longtime advocate for sustainability, she became one of the region's first LEED accredited landscape architects. Lissa has advanced adoption of best practices in stormwater management and low-impact development through her work. She has been a guest professor at the University of Arkansas where she served two terms on the School of Architecture Dean's Advisory Board. A licensed landscape architect, she earned her Master in Landscape Architecture from the Harvard Graduate School of Design.